Today through May 1st, fans can purchase a VIP Annual Pass to USL Live.com and get all of the non-Fox Soccer Channel USL First Division games for $49.99. 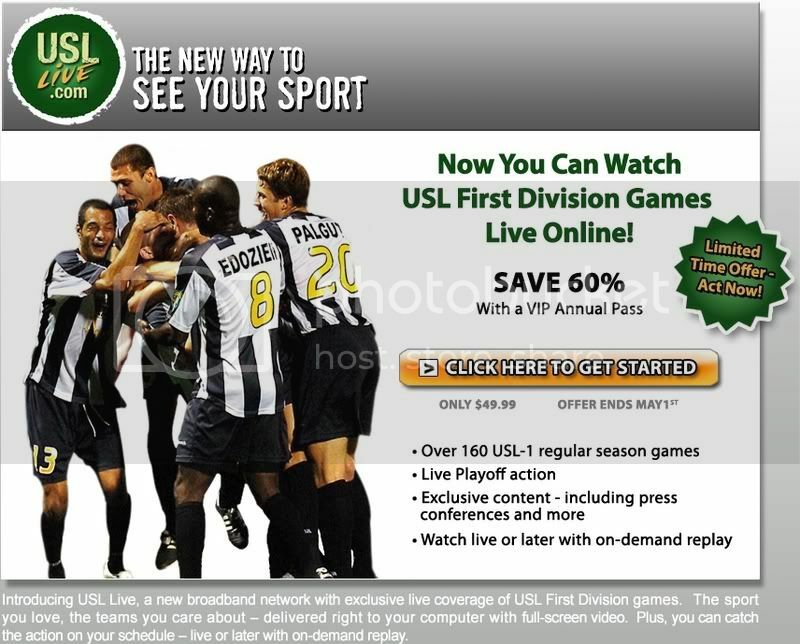 With the ability to watch live or have on demand replay of matches, the season pass seems like a solid offer for the Rhino fans that want to follow their team at home and on the road throughout the 2007 season. In a stunning announcement, Willie Fitzpatrick has left the Rhinos organization less than one month after accepting the post as the head coach of the women's team in 2007. Fitzpatrick had been Laurie Calloway's assistant on the men's side in 2005 and 2006, along with being Calloway's assistant with the Syracuse Salty Dogs previously. With the Rhinos combine opening up in Florida on Saturday and Calloway still looking to replace Rene Rivas, last season's women's head coach and men's assistant coach, this news comes at a bad time, it would appear. You can add Willie to the list of names of people that I am surprised to see leave the Rhinos this offseason. But, I do have to wish Willie good luck and good health as he was always a great guy to deal with. Abby is clutch. And clutch is everything! The US needed a win versus Sweden yesterday to advance to the finals of the 2007 Algarve Cup. And who better to step up in a big game, but the person who scored the golden goal in the Athens Olympics! Abby Wambach opened the scoring in the 39th minute and then scored the game winner in the 72nd minute as the US defeated Sweden 3-2. Carli Lloyd scored the other US goal in the 44th minute that put the US ahead 2-0 at the time. Wambach's game winner came one minute after Josefine Oqvist scored to pull the Swede's to within a goal at 2-1. Sweden would get a penalty kick goal in the 83rd minute from Victoria Svensson, but the US was able to kill the game from there. The US will face Denmark in the Algarve Cup final on Wednesday and the match will start at 12:30pm ET. For those that want to track the progress of the next great American soccer park, here is the place to do it. I wonder what this news could be? The fact that the press conference is being held in Miami is also very interesting. Former Chicago Fire and US Youth International midfielder Craig Capano was let go from Red Bulls camp due to never getting fully fit due to injury. Also, the Red Bulls are contemplating whether to sign Ansu Toure, formerly of the Minnesota Thunder, as he would have to be signed as a Senior International as he will turn 26yo during the season and would no longer count as a Youth International.